Kassim Abdul-Sater designed this eight-bar linkage to guide a lamp between folded and deployed configurations. Kassim works at the Institute of Micro Technology and Medical Device Technology (MiMed), Technische Universität München (TUM) in Germany. Siqi Shi designed this six-bar linkage to guide a folding handle on a hair-dryer using MechGen 3. 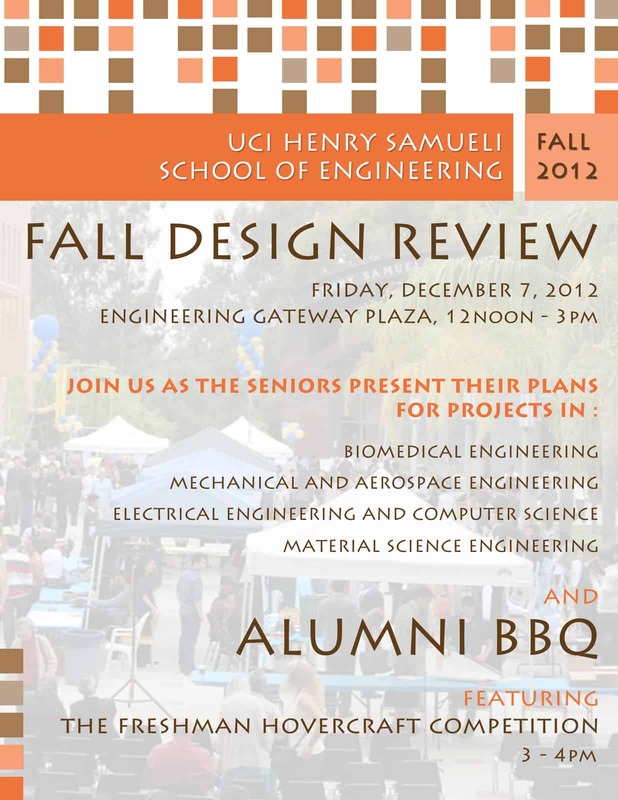 Please save the date of Friday, December 7, 2012 to join us at the 2012 UCI Fall Design Review and Alumni BBQ. This year includes the hovercraft competition in which hovercrafts designed and constructed our freshman project class will race to determine the best performing system. This flyer has been updated to include the location, which is the Engineering Gateway Plaza and the involvement of the Material Science Engineering majors as well. Tim Rasmussen designed this six-bar linkage to guide the petals of this flower. Mohamed Ali designed this six-bar linkage to guide the wings of a butterfly.